When I got the chance to visit Scotland for a few days, I put three goals in my mind – visit Edinburgh, a city I heard a lot about, visit a whisky distillery and try the Scottish national dish, the haggis. Did you know that, since the first century AD, Scotland is separated from England by a 120 km long wall? It was built by the Roman emperor Hadrian to keep barbarians away from the conqueered Britannic Roman Empire. This Maginot line somehow still separates a different culture from the southern UK territories. 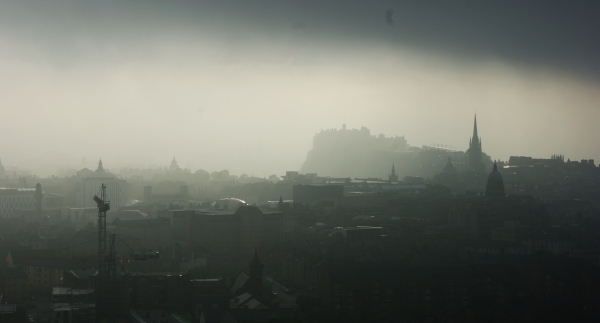 A delicate haze floats on Edinburgh this morning. This was the first sight I got from this picturesque medieval city. Edinburgh, situated just 600 km north of London, is the capital city of Scotland. 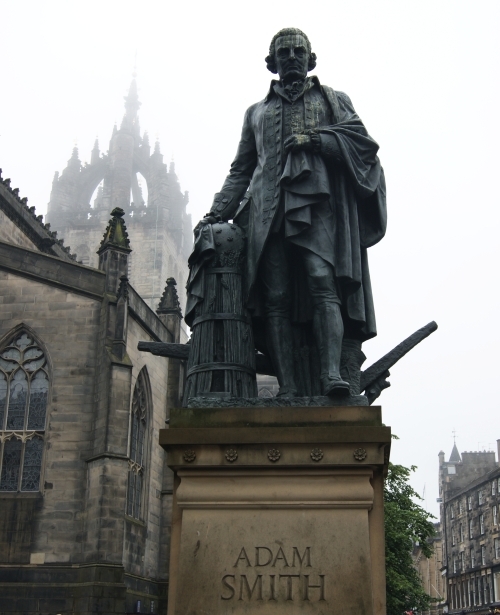 While moseying behind the Edinburgh cathedral, I stumbled upon the statue to Adam Smith (1723-1790). At first, I thought the pioneer of modern economics and author of the Wealth of Nations was born in Edinburgh, but no, he only taught a few times at the local university. He is actually born in Glasgow. But if you’re among the most influential Scottish thinkers, you should get your statue in Edinburgh, shouldn’t you? 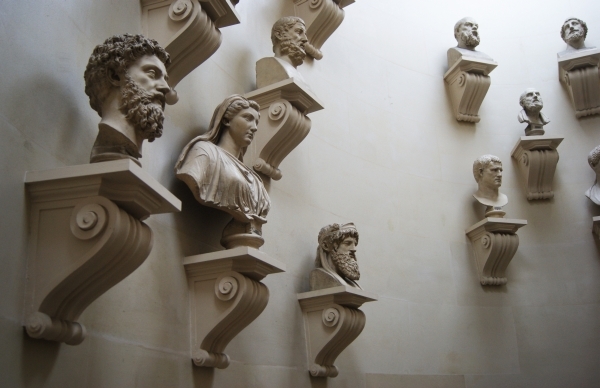 What I really love in UK is the free entrance to national museums, even for tourists. The Edinburgh Art Museum is no exception. You can find inside pictures by Van Gogh, Manet, Botticelli, Rembrand and even the famous “Kiss” by Rodin. You can’t decently stay in Scotland without trying the haggis, which is considered the national dish of Scotland after the Scottish writer Robert Burns wrote a poem “Address to a Haggis”. I first heard about haggis in France. Let’s face it: French, rightly proud of their food, describe haggis as a stuffed sheep belly (fr: panse de brebis farcie). The word “belly” is pronounced “beeelly” to show disgust, and to give you a biased idea of how haggis tastes. Actually, the haggis is a delicious pudding made of sheep’s pluck, onions, oat, spices, and cooked for three hours. Rightly the 2001 English edition of the Larousse Gastronomique notes “Although its description is not immediately appealing, haggis has an excellent nutty texture and delicious savoury flavour”. The second day, I left Edinburgh to go and see the magnificent Scottish countryside near the highlands of the Trosachs and Loch Lomond. It was time for my last goal: A whisky distillery. Scotland is famous for producing the single malt Scotch whisky. I decided to learn how it is made by visiting the Glengoyne whisky distillery in the vicinity of Stirling, a lovely medieval city . Single malt Scotch whisky is considered as the high end whisky, by comparison to other whiskies such as grain whisky (barley + wheat or corn), blended (barley whisky + spirit + alcohol) or even Bourbon whisky (corn). Curious to learn how single malt Scotch whisky is made? Basically, there are four stages in whisky making: Barley malting, fermentation, distillation and maturation. 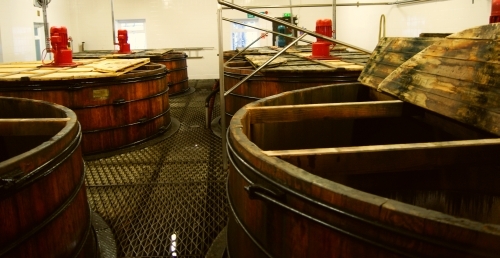 Whisky making process in Scotland is quite similar at its first stage to beer making. Only, at a further stage, it is distilled and transformed into a strong spirit. Technically speaking, you can say that Scotch whisky is a distilled beer. First, the raw product is barley. This cereal contains starch. You cannot process starch for making alcohol as it is insoluble in water. So you must transform starch into sugar during malting process. To malt barley, you must first spread water on barley grains allowing them to germinate, just like the peas you made grown in your childhood. Once grains begin to germinate, they are sent to a hot drying kiln. At this stage, germination and drying have transformed starch into soluble sugar. Sometimes, peat is used for drying barley. This will give the whisky a smoky, peaty flavour and smell. 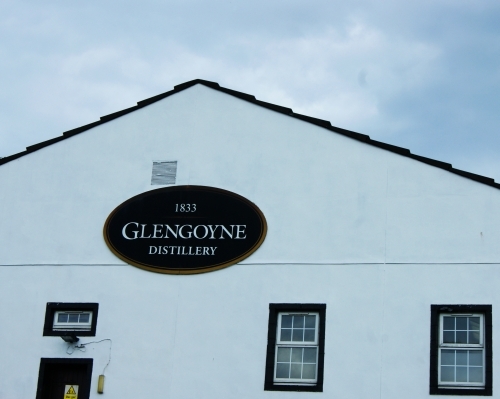 Islay whisky have a reputation for being the most peaty while the Glengoyne Distillery only uses hot air for drying, making a light, peat-free whisky. Nowadays, most whisky distilleries don’t malt their grain themselves anymore, that why I don’t have any picture of a kiln. 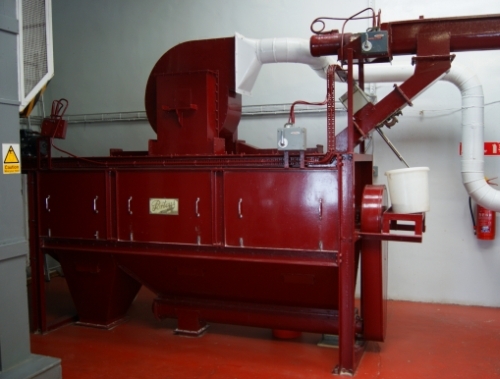 The malted barley is grinded inside this red grinder. The purpose of grinding barley is to make a sort of flour to allow a better sugar dissolution during mashing. The grinded malted barley is mixed with warm water in this big circular mixer called a mash tun. The charge in it is called the mash. You can see the mixing rake inside it. The mash will stay about 2 days in warm water, so the sugars extracted from the mash will dissolve fully into the mixture. The sweet mixture will be then called “wort”. The wort then goes to these big wooden tanks. At this stage, brewer’s yeast is added. The wort will then go through fermentation process that can take up to three days to complete. The yeast transforms sugar into alcohol and carbon dioxide. Does it remind you something? Yeap! Beer is made the same way! The fermented liquid is called “wash”, although some distilleries call it “ale”. That’s where the similarity with beer ends. The wash then gets 5 to 7 % of alcohol. 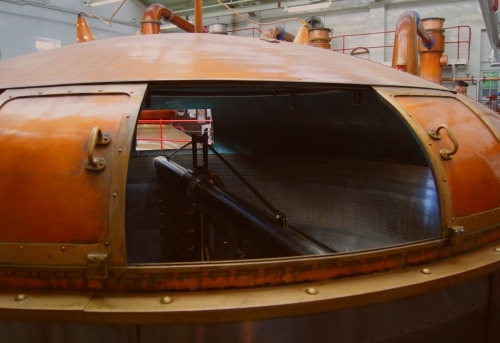 The wash is then sent to a big distiller made of copper like this one below. The wash is heated and alcohol, more volatile than water, evaporates into the upper pipe, condensates to make a 60-65 % strong alcohol. The wash is distilled tree times. By the way, it is no coincidence that pricy copper tanks and pipes are used during most of the spirit making process, instead of, say, cheaper stainless steel. 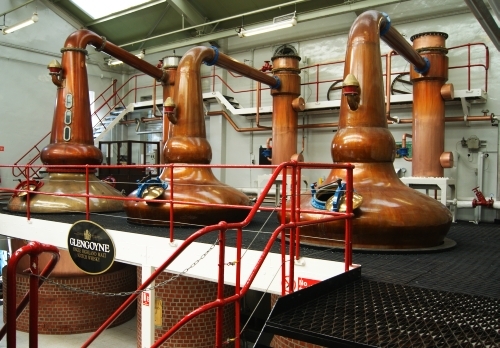 Contact with copper is a part of the whisky making process: the metal reacts as a catalyst with alcohol ethers, transforming them into a range of fruit aromas. The spirit obtained may be diluted with fresh water to lower its alcohol content, then put into oak casks to mature for many years. Water, along with barley and yeast, is one of the three key ingredients for making whisky. It takes 200 liters of water to produce 1 liter of whisky. Traditionally, Scotch whisky is matured in Spanish oak casks that used to produce Sherry wine. Along with copper fittings, these casks give whisky a specific subtle flavour. The Scotch Whisky Regulations fix the minimum maturing time for a single malt Scotch whisky at three years in oak casks. 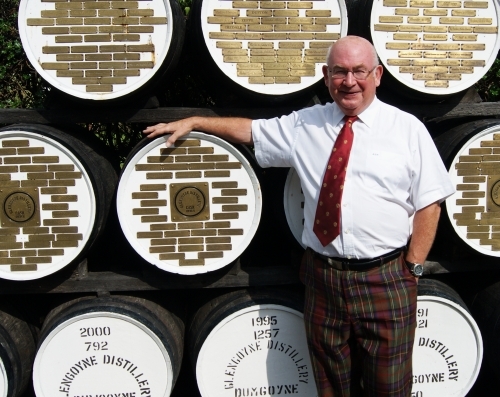 In practice, most Scotch distilleries keep whisky a minimum of 10 years. Oh, and if you have a bottle of whisky of such a quality, you should know how to taste it. Whisky is drunk at the end of the dinner. You can add an “angels’tear” of fresh water to smoothen its taste and make its aftertaste last longer. Never add ice, as it kills whisky aromas. Speaking about water, the word whisky comes from the Gaelic word “water”, just like “vodka” or “aquavit”. What a coincidence, uh? 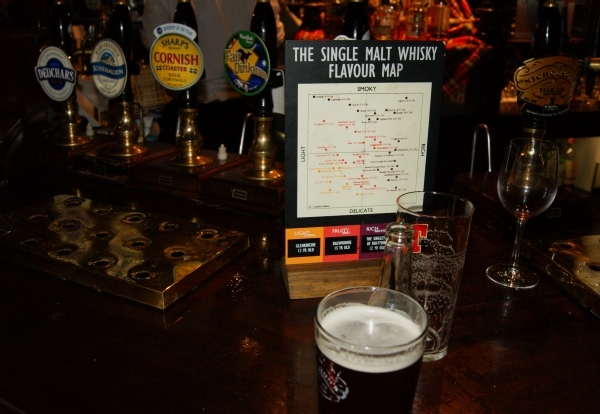 In Scotland, locals often ask for a “malt” at the whisky bar. This whisky flavour map in Edinburgh shows no less than 40 malts classified into rich, smoky, delicate and light whiskies. 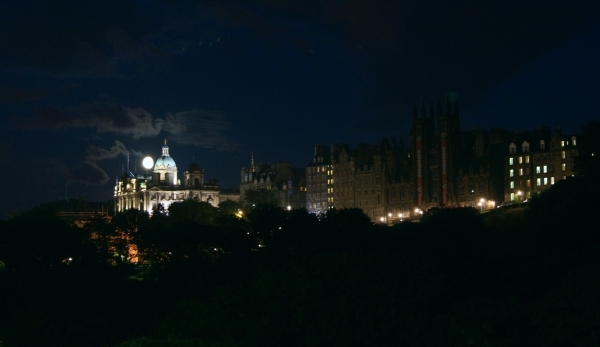 Edinburgh by night makes you feel like in a historical movie. Time to go home. The flight back with low cost airline Ryanair cost me 50 euros a one-way ticket, instead of 350 with Air France. However, I rate its value for no more. The hand luggage check was so picky, the advertisement was omnipresent, the rules for checking-in makes Guantanamo looking like a cruise, all this got on my nerves to a point that, whenever possible, I prefer avoiding like hell low cost airlines. The good side was that my seat neighbour was a nice fellow that made my journey shorter.